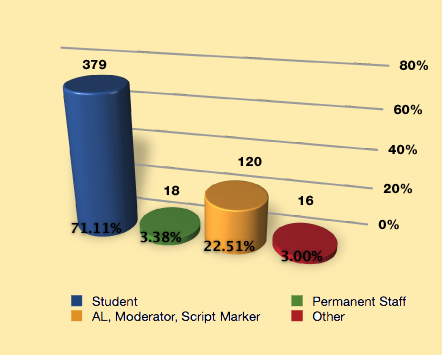 3.4% declared themselves as permanent members of staff, either academic or support (18 people). 3.0% chose the “other” category (16 people). Of the 16 others, 7 were alumni. 3 others should probably have been in the AL category but politically considered themselves permanent members of staff. 3 were combinations of ALs/students, 1 was an AL/external contractor, 1 was a student but hoping to become an AL, and 1 claimed to belong to all three categories. In this quick and dirty analysis, I have not assigned the “others” to appropriate existing categories, so their input is being omitted for the moment. I’ll leave that for a subsequent post. An even larger number of all surveyed respondents (43.52%) would choose Google Apps Eduction Edition. If a choice had to be made, Google Apps Education Edition was the most preferred by at least 40% of the respondents of a given role, with the exception of the 16 “Other” respondents. If the “don’t care either way” respondents (46) are considered, Google Apps Education Edition would be the choice of 50.28% of all respondents and Microsoft Live@edu 20.26%. If Microsoft Live@edu was chosen, it was by a student, far above any other respondent role (14.78% vs the next closest of 6.25%). The following data table and graphic illustrates the specific choices of different respondents by role. If you’re examining Table 1 visually, bolded cells indicate that the majority of respondents in that row choose that option. For example, in the first row, which is Google Apps Education Edition, the cells for students, permanent staff, and response totals are all bolded, indicating those groups preferred Google Apps Education Edition over the other choices available. Figure 2: Graph representing the preferences for a system by role. Figure 2 shows a cylinder for each role in the survey. 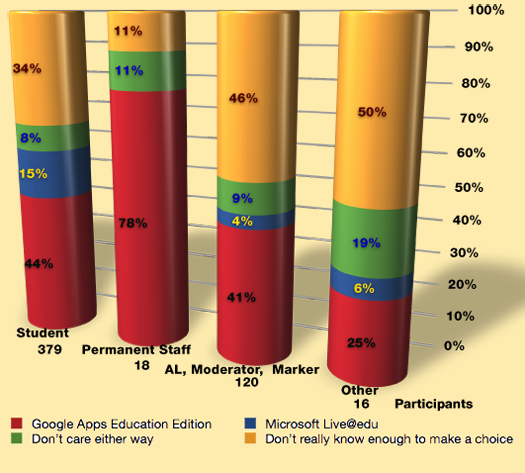 Each cylinder shows the percentage of respondents who chose Google Apps Education Edition, Microsoft Live@edu, don’t care either way, and don’t really know enough to make a choice with different colours. Google is red, Microsoft is blue, don’t know is yellow, and don’t care is green. While specific numbers aren’t shown on this graph, the total number of respondents in that category is indicated at the bottom, so you can either consult Table 1 for the number of respondents or do a quick calculation yourself. This was an unofficial survey that was designed and released on very short notice. Although I made a good effort to advertise it widely, the number of respondents is relatively low when compared with the Open University’s population of associate lecturers, permanent staff, and students. While I specifically advertised in places where I knew Open University community members would see the information, I cannot guarantee that everyone who responded was associated with the Open University. I cannot see a reason why external people would participate, but I cannot preclude the possibility. SurveyMonkey attempts to prevent the same person from completing the survey multiple times. However, that is based on the respondents’ IP addresses. Therefore, if a respondent changed location or has changing dynamically assigned IP addresses, it is possible they could have completed the survey more than once. This could have been avoided by collecting unique Open University identification information for each participant, but that would also have meant needing more stringent data handling and an increased reluctance to participate. The rest of this post takes a step backwards and considers motivation, deployment, and survey design. According to David Wilson, director of strategic planning in LTS, a choice is being considered between Google Apps Education Edition and Microsoft Live@edu and should be made shortly (in Snowball 36 – November 2009). Students are definitely migrating. A decision is still being made about what to do with e-mail addresses for associate lecturers. I thought it would be useful to survey interested parties about their preference if they had to choose between the two systems. I was especially interested in obtaining some indication of preference from students, who are guaranteed to be affected. The Business Steering Group, the group responsible for making the decision, will be meeting again soon and I will forward the findings of the survey to them for consideration. Which one of the following roles best describes your main role at the Open University? Your main role will be where you spend the majority of your time or where moving your existing FirstClass e-mail to the cloud will have the most impact. Which cloud-based system would you prefer, if you had to choose one or the other? Choices are randomised. I confirm that I am associated with the Open University as a student, associate lecturer, permanent staff, or in some other capacity. The first question was intended to categorize the different respondents by their role at the university. It was recognized that some people have more than one role. They were asked to choose the one where the change would have the most impact. The role was then used to organize the results of the second question. The choices were randomized to avoid any suggestion of bias on the part of the survey giver. The third question was where the respondent agrees that they are associated with The Open University in some way. The survey is not very useful if it is completed by parties not affected by the outcome. The survey was prefaced with some brief information about the motivation for the survey and how the survey results would be used. Respondents were also given two links from Google and two links from Microsoft on their respective products. Respondents were also given links to two articles from independent bloggers or education organizations reviewing the two products. Respondents were assured that the survey was unofficial and no personal details, including computer IP addresses, were being recorded or stored with the survey. They were also assured that I would only be using the data for providing indicative preferences to the Open University and I had not sought or received permission from the Open University to conduct the survey. Contact details by e-mail or Twitter were included. A microblog entry on Twitter with a shortened URL leading to a blog post with a bit more background information on the survey and slightly expanded commentary on the survey than in the actual survey itself. I made several postings throughout the survey period, each time asking others to also pass the information on, which several people did. A posting was made in the “Lounge” section of Platform, the Open University Community site. The posting was made the 25th of November and Platform claims “0 views”, but that seems to be an error as all threads have 0 views even when they have responses. Even considering the various caveats in place, I think it is clear there is a strong preference for Google Apps Education Edition if people have to choose between one or the other. Examining the free-form comments, I know there is a belief from many people that e-mail should be kept in-house or that a choice of “none of the above” would have been preferred. Many people are concerned about keeping .open.ac.uk addresses for academic hardware and software purchases. Many people also expressed concern about security and data privacy issues with their e-mail being managed by either Google or Microsoft. I’ll examine these in more detail in a follow-up report. Thank you to all those who took the time to respond and comment. I would also like to thank those people who reposted or re-tweeted the survey information. As promised, I will be passing this information along shortly to the Business Steering Group who is making the decision. If you have any comments or questions, please feel free to leave a comment here, message me as @Eingang on Twitter, or e-mail me as mah383 on FirstClass server 2 (tutor.open.ac.uk). Interested as an impartial observer in the results. I wonder how much of the bias is due to a philosophical dissaffection with MS compared to any practical/functional consideration. I suppose what I’m saying is “do people vote for what is good for them or on a feeling”? I’m particularly interested as we may be considering a similar move for University of Plymouth, but would only see student feedback like this as a minor factor in the choice of vendor in my personal view. I’d be more interested in a list of features/functions the students wanted prioritized with a mapping exercise to the different offerings. I wonder if you have considered that as an alternative survey format rather than presenting the choice of names of the services? Yes, I did. I agree that, for a formal process of consulting students, a different approach would have been more useful. The timeframe I was working with here was very short, so I didn't have the time to figure out a list of features and construct a survey that would allow that. I was also very interested in making the survey very simple and very short to complete to increase the number of participants likely to respond in the short time I had to advertise and collect responses. I do know, from perusing the free-form comments, that there was quite a bit of anti-Google or anti-Microsoft sentiment in general, which influenced people's choices more so than the features available. I did try to give people some background but, of course, I had no way to ensure they'd actually considered or read the background material which did discuss the various features available. When I myself considered the features, the offerings between the two seemed fairly similar, with the exception of Microsoft's SkyDrive service, a service to essentially provide file hosting of almost any kind of file in the cloud. Google's offering doesn't have the equivalent for any kind of file and I could see how a Dropbox-like service could be very useful. I was surprised by the strong preference for Google across the board, even amongst students. Hotmail (originally owned and developed by Sun Microsystems) has been around a very long time and Microsoft does generally have a very large community of supporters. Again, when considering the free-form comments, some of this was due to security/privacy concerns, with at least some people believing Microsoft had a very poor track record. In addition, there was a common concern about compatibility for multiple operating systems and a belief that Microsoft had not done well with cross-system and open standards issues previously. So, yes, at least some percentage of people voted on a feeling (and admitted to doing so). I'm looking forward to having some free time to go through the comments more carefully, coding them for common themes, and then do an analysis of the common themes revealed. As a bit more background information, which you might not have: The Open University's Business Steering Committee had already decided it would be one of the two. They're very close to making a decision based on internal criteria and appropriateness that they've decided. My understanding was that, because the two offerings were basically very close in terms of functionality, the committee was leaning towards one but had not yet made a decision and this might be enough to tip them one way or the other. Ideally, I would have liked to have done a full-scale survey with a more representative sample and additional questions, but I hope this is better than not having any input from the affected people at all. 1) Under "Key Findings" point #4, I've correct the '15 "Other"' respondents to 16. 2) Under "Respondents", I've corrected the associate lecturer section from "22.5 people" to "120 people". Thanks to Mark Spicer for pointing that out. 3) Under "Caveats", I've added in "community members" to the sentence "While I specifically advertised in places where I knew Open University would see the information…"
Apologies for those. They have been corrected in the full report article above.